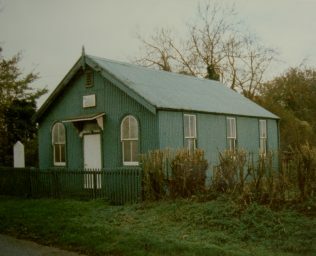 This tin chapel is situated right on the south east edge of the village. It was opened in 1913 and one reference says it was closed in 1999. On Google Street View for 2009 it appears unused with a lot of peeling blue paint. A picture of this chapel at the end of its life may be found on page 67 of Smith, Ian ‘Tin tabernacles: corrugated iron mission halls, churches & chapels of Britain. Camrose Organisation, 2004. Bristol Primitive Methodist chapel - but which one is this?